Corporate sponsors who wish to make in-kind product donations should contact us to discuss our specific needs. Please note, to keep costs down we purchase bike-specific items from wholesalers. 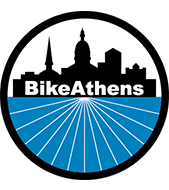 If you would like to help us further reduce our cost burden for bike lights, locks, and consumable parts, please let us stretch your dollar through a financial gift. We love snacks! Help us keep our volunteers happy with food and drinks: salty, sweet, healthy, fizzy, it’s all good. Thursday nights are heavy snack nights. We also host special events throughout the year, so please get in touch if you would like to cater for us.